cheesecake with fresh or frozen blueberries. 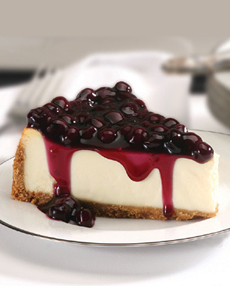 May 26th is National Blueberry Cheesecake Day. It may be hard to find a piece of blueberry cheesecake—cherry and strawberry are the popular berries toppings. But you can easily make your own, from fresh or frozen berries. A homemade sauce is much tastier than the gelled goop into which berries are set on many commercial cheesecakes. Then, just pick up a slice of cheesecake, top and celebrate. You can also use the berry topping on ice cream/sorbet, pancakes/waffles, puddings and other cakes: angel cake, chiffon cake, pound cake and sponge cake. 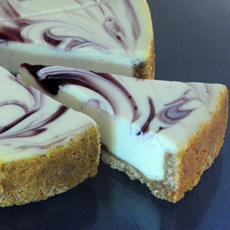 You can bake your own cheesecake and create a blueberry swirl cheesecake by swirling the topping into the batter. Here are some of our favorite cheesecake recipes. 1. MIX the cornstarch with 2 tablespoons of cold water in a small bowl. 2. COMBINE the blueberries, 1/2 cup of water, sugar and lemon juice in a saucepan. Cook over medium heat, stirring frequently, until the mix comes to a low boil. 3. GENTLY STIR the cornstarch into the blueberries, taking care not to crush the fruit. Simmer until the sauce is thick enough to coat the back of a metal spoon (about 5 minutes). 4. REMOVE from heat; gently stir in the vanilla and zest. Cool; refrigerate until ready to use. Warm very slightly in the microwave for easy pouring. You can also swirl the blueberry topping into the cheesecake batter. Photo courtesy Cheesecake.com. Adjust the amount of sugar to the sweetness of the berries. We don’t oversweeten, to allow the flavor of the blueberries to come through. For a thinner sauce, slowly add water by the tablespoon until you reach your preferred consistency.